It’s been a long time since our last post, but that doesn’t mean that nothing has been happening. Just like usual, winter gave way to spring and the farm slowly woke up. When I saw the raspberry trellises crushed from the weight of the snow and all the snapped canes in the mud in the rows I was kind of bummed. Yet by mid June things were looking green and healthy. I re-attached the trellis cross bars with big 4 inch lag screws. When my brother, Jeremy, came up for for a week we manured the beds and got ahead of the weeds. Then my dad helped with the weeds a few weeks later. I looked around and said to myself, “well another year out here and I’ve gotten my work done.” Little did I know that the work had only just begun. 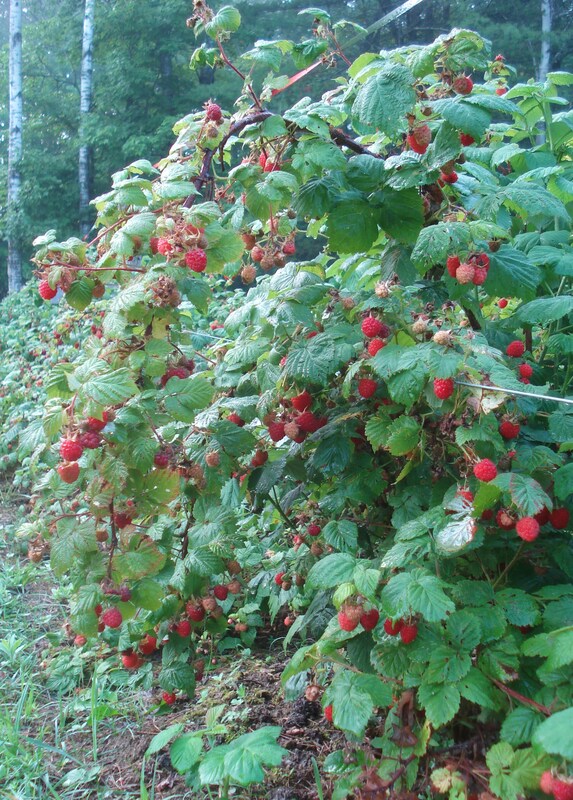 When the raspberries came ripe they bent the canes down low and folded them over the trellis lines, pendulously swaying with fruit. I picked for market only to find 2 days later that I had even more raspberries! Wish I had some of your berries. Was picking at least a pint a day for a week, then drought and berries are done!. Would really love some currants, too. Looks like all is going well. Love, Aunt Sharon (want to make jelly). I was here and thanks for the shout out.